Vote for Zombie Boy Comics in this year’s Harvey Awards! Hey Comic Folks! Webcomics are representing in this year’s Harvey Awards. 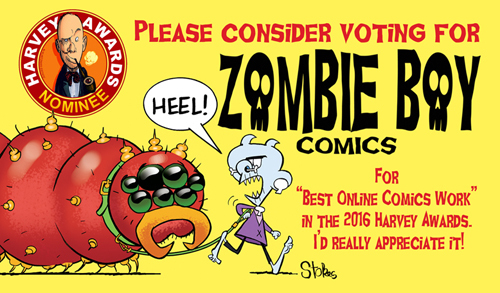 If you haven’t voted yet, I’d appreciate it if you could consider “Zombie Boy Comics” in the “Best Online Comics Work” category. The deadline for 2016 Harvey Award voting is Monday, August 8, 2016. Thanks, y’all! Voting is currently open to comics professionals online at HarveyAwards.org. Thank you kindly, Peter! I do appreciate it! All the best Mark. I went to vote but found out that I need to be a Comic “Professional”. You are eligible, Tony. You create a webcomic on a regular basis. That counts. Other webcomic artists have voted, so I know it’s possible.